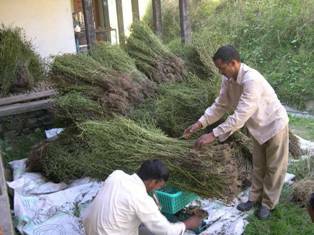 Medicinal plants distributed across Himalayas are normally slow growing and takes long period of 2-3 years to complete the life-cycle. 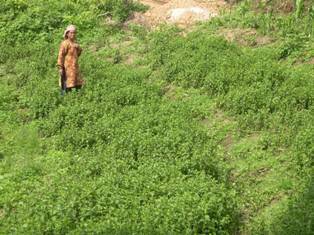 Commercial consumption has threatened the availability of medicinal plants in the Himalayas. The cultivation of medicinal plants is inevitable to feed the rising demand of industry. Keeping in view the demand and threat to this valuable resource, efforts were made to develop ex-situ propagation techniques and agro-technology package for commercial cultivation of selected Himalayan species. During last one decade success was achieved in standardization of agro technology package for commercial cultivation of Swertia species. Commercial cultivation of Chirata (Swertia) was initiated with active participation of local women in their revenue land for diversification of agriculture and livelihood. Women were trained in sowing, weeding and maintenance of the crop. Cultivation practices were free of chemical fertilizers and farmers used vermicompost to meet nutritional requirements. All women cultivating Chirata were provided vermiculture to prepare vermicompost.